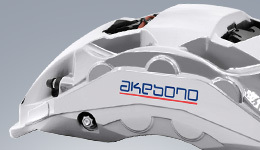 Initiatives in Purchasing | Environmental Initiatives | Corporate Social Responsibility (CSR) | Akebono Brake Industry Co., Ltd.
Akebono introduced its Green Purchasing Guideline in 2005, revising it in 2011. 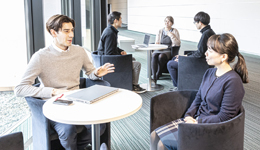 Under the guidelines we are considering the environment and CSR from the purchasing stage by working together with suppliers to procure materials, components, and secondary materials that have a low environmental impact. We are also encouraging our suppliers to improve their environmental management performance by recommending activities to acquire external accreditation such as ISO 14001. Going forward, our next challenge is to promote these practices at overseas bases as well. Green purchasing refers to the preferential selection and acquisition of products that cause less negative environmental impact. The scope of products covers materials, secondary materials, office articles and equipment used in the course of manufacturing. 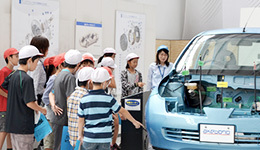 Manufacture of “Green Products” requires the practice of green purchasing. The U.S. Congress passed the “Conflict Minerals Rule,” which aims to cut off sources of funding for armed groups in the Democratic Republic of Congo and neighboring countries. The rule requires manufacturers to ensure public disclosure and reporting related to “conflict minerals,” obliging them to thoroughly track the origins of minerals that are supplied to them. Akebono conducts investigations in accordance with industry standards from a CSR procurement perspective and has not found any use of conflict minerals. Section 1502 of the Dodd-Frank Act targets minerals containing tungsten, tantalum, gold, and tin produced in the Democratic Republic of Congo and neighboring countries that provide sources of funding for armed groups involved in the conflict. Akebono is taking steps to ensure safety across its supply chains by working to eliminate occupational accidents. We urge our suppliers to create safer, more secure work places by raising the theme of safety at our suppliers meetings held throughout the world and in our Sewa Kai study sessions consists of major suppliers. In cooperation with our suppliers, Akebono performs testing of purchased products to determine if they contain substances of very high concern (SVHC*) or banned substances. 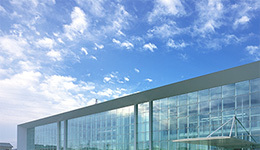 The tests are performed on the individual product level and their results are communicated to our customers. Furthermore, we are also promoting compliance with laws and regulations on labeling, etc. of purchased products. A substance may (but not necessarily must) be designated as SVHC if it meets one or more of the following criteria: it is carcinogenic, mutagenic or toxic for reproduction, and in addition is either persistent, bioaccumulative and toxic, or very persistent and very bioaccumulative. Such substances are identified as having probability of causing serious adverse effects to human health or the environment. 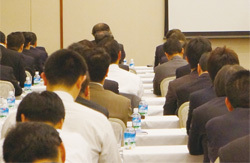 Akebono holds annual suppliers' meetings every year to facilitate their understanding of the Company's initiatives. We gave presentations on each business unit's policies aimed at achieving the goals of our current midterm business plan while sharing information on initiatives undertaken in regions worldwide. Also, we urged suppliers to pursue quality enhancement activities and ongoing cost reductions. 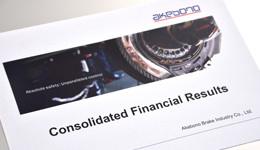 Going forward, Akebono will pursue uncompromising cost-reduction and quality-control efforts in collaboration with its suppliers.